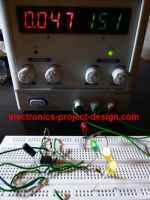 This project is based on integrated circuit from Holtek Semiconductor HT6221/HT6222. Similar parts used to be produced by NEC Semiconductor uPD6121/uPD6122. These ICs are commonly used in television and VCR infra red remote controls, garage door controllers, car door controllers, security systems and other remote control applications. They are capable of encoding 16-bit address codes and 8-bit data codes. Each address/data input can be set to one of the two logic states, 0 and 1. The HT6221 can have keys up to 32(K1~K32) and HT6222 64 keys (K1~K64). When one of the keys is triggered, the programmed address/data is transmitted together with the header bits via an IR (38kHz carrier) transmission medium. The typical 32 pins HT6221 schematic can be downloaded here. However, the values of 1k ohm and 47 ohm at the output pin 5 of the IC can be reduced to increase the distance the IR signal is transmitted. After the transmission codes are sent, the DOUT pin generates transmission codes with a carrier, and the LED goes low to drive a transmission indicator. When one of the keys is triggered for over 36ms, the oscillator is enabled and the chip is activated. If the key is pressed and held for 108ms or less, the 108ms transmission codes are enabled and comprised of a header code (9ms), an off code (4.5ms), low byte address codes (9ms-18ms), high byte address codes (9ms-18ms), 8-bit data codes (9ms-18ms), and the inverse codes of the 8-bit data codes (9ms-18ms). After the pressed key is held for 108ms, if the key is still held down, the transmission codes turn out to be a composition of header (9ms) and off codes (2.5ms) only. Logic 0 is represented by timing 1.12ms and logic 1 by timing 2.24ms using pulse position modulation method. The address code and data codes are set using the diodes 1N4148 and resistors 51K ohm and whether D7 is connected to Vcc or Ground.